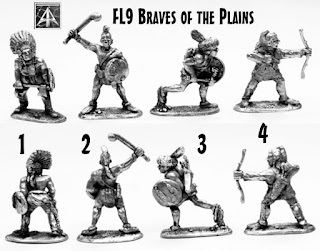 The last fantasy / historical release for the month from Alternative Armies is now online. A pack of useful 28mm scale North American Braves suitable for 18th century or later periods in any game system. This is an orphan code in our range and we hope you like it. We will have more FL releases in November. FL9-01: North American Indian Brave with axe and shield in headdress. FL9-02: North American Indian Brave with wooden club and shield. FL9-03: North American Indian Brave running. FL9-04: North American Indian Brave with bow.